The Potomac Institute Press release of Al-Qa’ida: Ten Years After 9/11 and Beyond, is more timely than ever in light of recent events. The arrest of a man who allegedly claimed al-Qa'ida ties and planned to blow up the Federal Reserve building in New York, along with reports that the deadly attack on the US consulate in Benghazi could be linked to an al-Qa'ida affiliate, are stark reminders that the terrorist group continues to exert influence despite severe blows to its command and control structure. 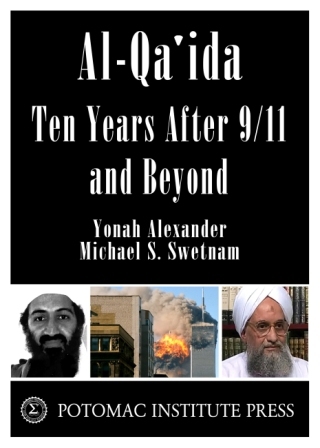 To learn more about why this is a threat that just won't go away, now is the time to read Al-Qa’ida: Ten Years After 9/11 and Beyond (Potomac Institute Press, 2012) by ICTS Director Prof. Yonah Alexander and Institute Chairman and CEO Michael S. Swetnam. Click here to find the book on Amazon.com: click here for the Kindle edition. Al-Qa'ida: Ten Years After 9/11 and Beyond covers the evolution of the terrorist group in the critical years since the 9/11 attacks and in the wake of the death of its founder, Usama bin Laden. As the authors note, the Al-Qa'ida central organization may be slowly dying, but its offshoots around the world live on. The new book is a follow-up to the authors’ 2001 book, Usama Bin Laden’s Al-Qa’ida: Profile of a Terrorist Network (Transnational Publishers, 2001), which came out just months before the 9/11 attacks and was widely read by scholars, journalists, and the public. “This is the indispensable book on al-Qa’ida, its spawn, and its affiliates. Usama and many of his lieutenants have been killed, and the central 'base' weakened. But radical Islam and sundry jihadi organizations live. Yonah Alexander and Michael S. Swetnam have been writing about al-Qa’ida since 1988; they have not lost their touch.” Don Wallace, Jr., Professor of Law at Georgetown University and Chairman of the International Law Institute. Prof. Yonah Alexander currently heads the International Center for Terrorism Studies at the Potomac Institute for Policy Studies. As a former Director of the Terrorism Studies Program at The George Washington University, Prof. Alexander has been a respected voice in the field of counterterrorism research for decades. He has also previously taught at American University, the Columbus School of Law at Catholic University of America, Tel Aviv University, The City University of New York, and The State University of New York, among other institutions. Michael Swetnam is CEO and Chairman of the Potomac Institute, and currently serves on the Technical Advisory Group to the United States Senate Select Committee on Intelligence. He is a former CIA official, and a counterterrorism and national security expert who has also served on the Defense Science Board (DSB) Task Force on Counterterrorism and the Task Force on Intelligence Support to the War on Terrorism.